Turkey Shepherd’s Pie, a dish that sums up what comfort food is all about. 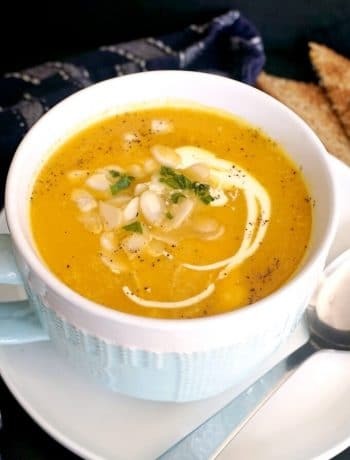 Hearty, easy to make, and a great choice for a healthy family dinner, this recipe is the perfect example that homemade food is the very best. 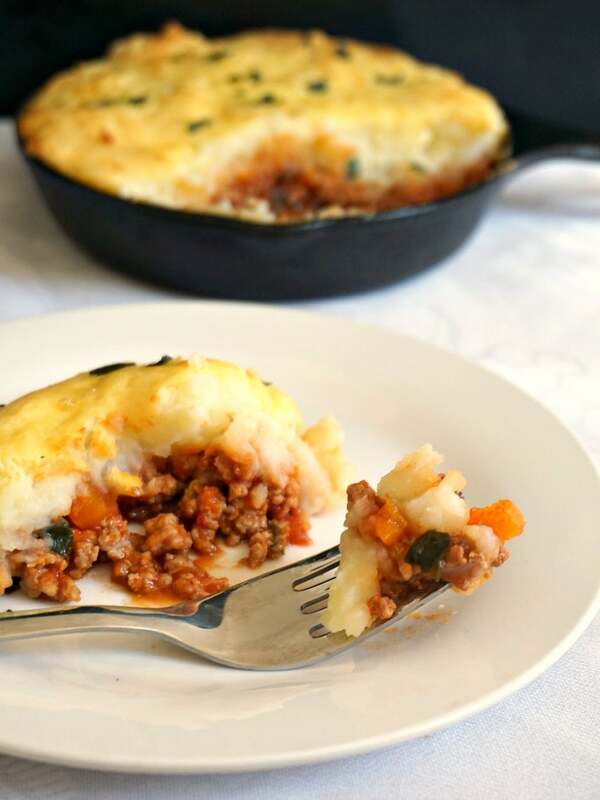 Before we go any further, I feel that the truth must be said: shepherd’s pie is traditionally made with lamb, and cottage pie, which is pretty similar to this recipe, is usually made with beef. Now, nothing stops us from making this recipe our own and tweaking it the way we want. Hence the addition of ground turkey instead of lamb. Not that there is anything wrong with lamb for those of you who like this meat. But since I have decided to tell the truth, I need to say that I don’t like lamb. At all. Growing up, we never had lamb in my family, and that’s because mum does not like it, so she never cooked either. I did try to eat though, but I found the smell off putting. I guess that’s something you get to like as a child, as later on our taste is harder to change. In my case, quite impossible. Goat’s cheese, anything goat’s, lamb, mutton, etc, a big no no for me. 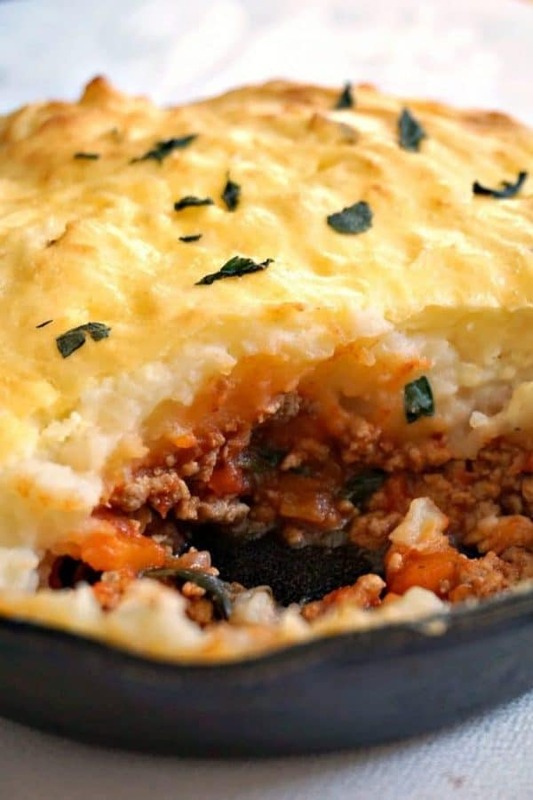 So, there you go, a delicious Shepherd’s Pie with ground turkey. By all means, you can use lamb and follow the exact instructions, and you get the same dish. Yummy! With Fall upon us, and Thanksgiving just around the corner, turkey is inevitably the favourite meat anyway. And then the cold weather makes us go back to our favourite comfort food. Gone are the days when salads and ice cream were on the menu on a daily basis. Holidays are over, kids in school already, so it’s high time we got cooking again. And what a better recipe to put on the table than this comforting dish. 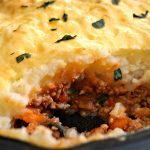 If like me you worry that your kids don’t have enough real food, well, this shepherd’s pie has got everything you want: protein-packed meat and healthy vegetables. And usually kids like this kind of dish, even my picky eater does. What I usually do, I make more filling than necessary, use whatever is needed for this dish, and freeze the rest. In this way, I can use it on a different day with either spaghetti, couscous, bulgur wheat, etc, and that’s another dinner sorted. Meal planning at its best! You can even make more mashed potatoes, and the leftovers can be used for some nice tuna patties or chickpea patties. And you have got the appetizer sorted as well. 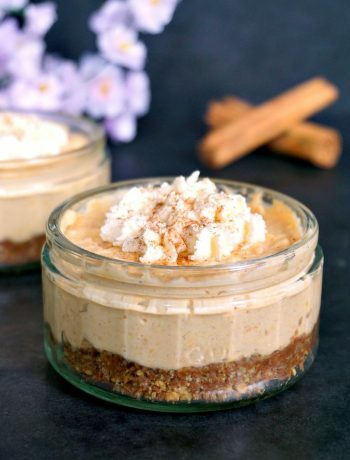 There’s so much you can make with the same ingredients, and no one will ever know how little effort goes into preparing healthy homemade food. No need to spend a fortune on take-aways or ready meals, you can so do it yourself. 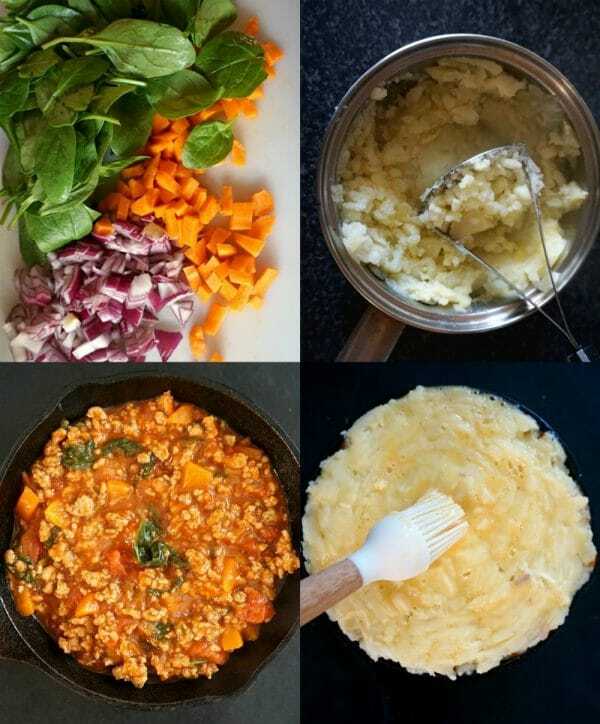 Another way of totally transforming this dish is to use sweet potato mash instead of the regular one, or even cauliflower mash. Some people prefer these over the white potato mash, I just like it way too much, so there is no swapping here for me. But no matter what topping you choose, rest assured this dish is sheer heaven. A must try for your Thanksgiving dinner! If you’ve liked my TURKEY SHEPHERD’S PIE or any other recipe on the blog then don’t forget to rate the recipe and let me know how you got on in the comments below, I love hearing from you! You can also FOLLOW ME on FACEBOOK, and PINTEREST to see more delicious food and what I’m getting up to. 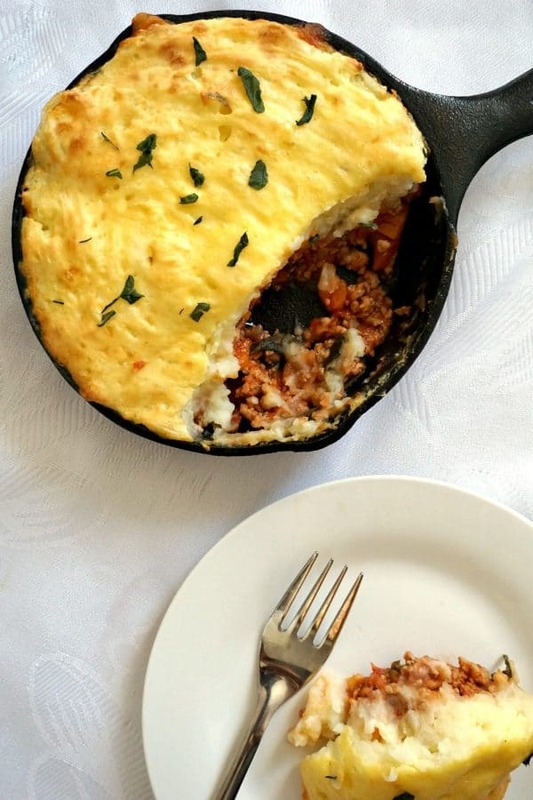 Skillet Shepherd's Pie with Ground Turkey, a dish that sums up what comfort food is all about. 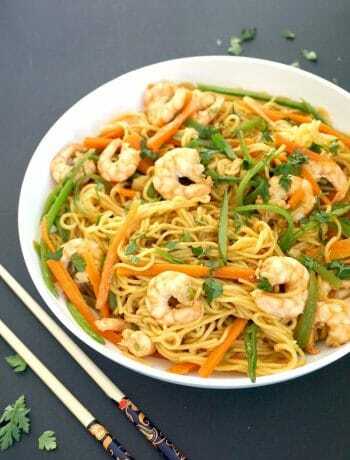 The perfect choice for a healthy family dinner, this recipe is easy to make and so delicious. Peel and chop the onion and carrot and heat up the oil in a skillet. Fry the onion and carrot for 2 minutes stirring occasionally then add the minced beef and continue to stir until brown. Cover the mixture with the stock and let it cook on a medium heat until the liquid is absorbed. Meantime,get on wit the mashed potatoes. In a large pan, add the potatoes and boil in salty water until tender. Drain the water, peel and mash. Add the milk and butter and mix well until creamy. Once the stock is absorbed, add the tomato purée and chopped tomatoes to the pan, season with salt, ground black pepper, worcester sauce, dried rosemary and oregano and mix well. Let it simmer for a further 5 minutes, then remove from the heat. Top the ground turkey with the mashed potatoes. Beat the egg lightly, and brush the top of each cottage pie with it. Bake in the oven for about 30 minutes or until golden brown. Serve hot! I LOVE shepherd’s pie! I’ve actually never thought to make it with ground turkey before so I am really going yo have to give this a try. Looks delicious! Thank you! I hope you’ll like it!